While we all dream of one day being debt-free, for many Canadian’s the reality is that they will still be paying off debts even when they retire. According to Statics Canada one in three retired Canadians who are at least 55 years old are several thousand dollars in debt, the average owed being $19,000. And it is not just retirees in debt. As the cost of living continues to rise more and more people are finding themselves in debt just to survive economically. A report published by Statistics Canada in 2012 found that while those under 45 make up less than half the population they carried 54 per cent of all the country’s debt. A breakdown of the average debt each age group was: – Under 45: $129,200 – Between 45 and 64: $102,800 – Over 65: $66,000 Married Canadians with children are also more likely to have higher debts than any other group. A breakdown of this found: – Married with children: $144,600 – Married without children: $71,000 – Single parents: $100,800 – Single people: $63,200 Concerns over the amount of debt Canadian families owed was highlighted in 2011 by the Vanier Institute of the Family when it released a report that found that the average Canadian family were $100,000 in debt and owed more than they earned. This took into account all different types of debts held including mortgages, student loans and credit cards. While many assume that debt is a bad thing and that it is better to be debt-free, debt in fact can help to keep the economy going and taking out calculated debts can help to improve your long-term finances. According to The Forum Research Survey 38 per cent of Canadians have no debt at all, including no mortgage, however not all Canadian’s feel the same way and the average debt load in Canada is $156,000. In fact an article published by the Financial Post stated that debts makes up more than 150 per cent of Canadian household income, so while being debt-free is considered the dream, the reality is that debt is an important part of the majority of Canadian’s finances. It is clear then that debt is a part of many Canadian’s lives, especially for married couples with children. This means that although becoming debt-free is the long-term goal for many people, the reality is that learning to live with debt is a more practical short-term solution. While it is important to separate good debt, the debt that will help you to fulfill long-term goals such as owning your own home, and bad debt, such as the debt you incur just trying to live month-by-month; learning to live with your debt will help you to see it as something that you shouldn’t be ashamed of or something that indicates your failure to control your finances properly. So if you are in debt and cannot see yourself being debt-free anytime soon, here are some tips that will help you to learn to live with it: Be positive about your debts The first step is to be positive about your debts. This doesn’t mean you should see debt as a good thing, however it does mean that you should accept that debt is a natural part of modern finances. If the debt you have is because you studied for a degree or have bought a house, then you need to remember the reason why you chose to take out the loan or mortgage in the first place and keep in mind how going to college or owning your own home enriches your life. Another reason why it is important to remain positive about your debt is because it will help you to see it as more of a short-term state rather than being saddled with debt for the rest of your life, remember you have control over your debt and the amount your borrow and pay back, so just because you are in debt doesn’t mean you’ve lost control over your finances. Know what you owe and to who When living with debt it is important to know how much you owe and to who. Make a list of all your debts, including your credit cards, loans, mortgages and student loans, how much you owe to each and to whom you owe the money. Each year you should re-visit this list and mark how much of the debt you have paid off, this will help you to see that although you are in long-term debt you are slowly reducing the amount you owe. If a large part of the money you owe is because you’ve used it to invest in your future, for example by studying for a degree, you could also note how this debt has helped you have a better lifestyle, in this case has your degree helped you get your dream job? Another reason why you should have a clear idea of what you owe, and to whom, is because it will enable you to feel in control of your debts. When learning to live with debt it is vital that you still feel in control of your finances as this will help you to view your finances in a positive way, while also preventing you from taking out further debt because you feel you are in a lifelong spiral of debt. 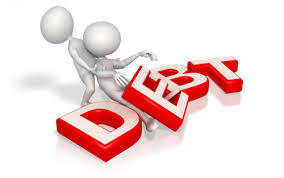 Only take out debts that you need As already stated there is good debt and bad debt. The good debt is the one that has been taken out as some sort of investment, whether it is into your education, career, your children’s future or your retirement fund; however bad debt is the loans and credit taken out to pay for non-essential or unimportant products that will have no return on investment. When taking out future debt you should determined whether the debt will have a positive impact on your future and ideally have a good return on investment, in short is what you want the loan for important enough to warrant being in debt for years to come? If you decide that the loan is worth it, then you should take on the debt guilt free, however if you decide that it isn’t then you should reconsider taking out the loan and instead Endeavor to save up for the item instead. You should also keep in mind that while taking on a certain amount of debt is an essential part of modern life, you should not use this as an excuse to take on debt for unnecessary goods. Constantly buying goods on credit is one of the quickest ways to see your debts mount up and they can soon spiral out of control. Ensure that you can make minimum payments Ensuring you can make your monthly minimum payments on your debts is essential when living with debt. Ideally, you should be paying more than the minimum repayment each month, especially if the loan or credit has a high rate of interest such as a credit card. Saying this, however, just ensuring you can make the minimum repayment again helps you to feel in control of your debts and proves that they are manageable for your everyday income. Taking on too much debt so that you are unable to meet even the minimum payments means that your debt quickly feels out of your control and could result in long-term financial problems and even having to declare yourself bankrupt. As well as this, many reputable creditors won’t lend to you if they are unsure that you will be able to make the minimum payments, so ensuring that you are able to meet these payments is vital in securing a good credit rating. You should also make it a priority to ensure that you never miss a payment, even if it is just through disorganization, again missing a payment will have a massive impact on your long-term credit rating which could mean you have difficulty in securing loans and credit in the future. Another important step when learning to live with debt is not falling into a cycle of debt. While this may seem a contradiction, after all if you’re prepared to live with debt does this not mean you will constantly be in debt? However this is not what learning to live with debt is about. Learning to live with debt means living with the necessary debt you have accumulated through loans, credit and mortgages that have enhanced your life, rather than falling into debt just to get by each month. This second type of debt means that you are living beyond your means and usually involves you having to take out more and more credit cards and loans in order to retain your standard of living. If you find yourself falling into this, you should immediately take a step back and take another look at your finances and start cutting back, otherwise you could find yourself in more debt than you are able to cope with. Prepare for the worst One of the biggest stresses about being in debt is the fear of what will happen if the worst happens and you can no longer pay your monthly repayments. This could be a result of a number of things from losing your job to getting divorced, all of which are events many of us would rather not think about. However, if you are going to live with debt and not be constantly stressed or worried it is important that you have a plan in place just in case the worst case scenario happens. Sometimes your creditor will put your payments on hold for a certain amount of time or will allow you to make a much smaller minimum repayment, but some creditors will not be as flexible and you need to be aware of this before agreeing to the loan. If not making the monthly repayments could result in your losing your house or other valuable items then you need to have a back up financial plan in place in case you do suddenly have a drop income. Would you be able to downsize to a smaller house with more manageable mortgage repayments, for example? While it is important to be aware of possible problems that could arise from the debt it is also important not to let potential issues impact on your everyday life through stress and worry and if it is then perhaps you need to rethink if the debt is worth it. Create a plan to clear your debts Finally, often the best way of living with debt is having a plan in place to pay off all your loans, credit cards and mortgage so that one day you will be debt-free. For many people having an end in sight to their debt, no matter how far into the future it is, means that they know that they won’t be in debt for the rest of their lives making it more acceptable to live with today. Ideally, if you have already followed the advice above you will have a clear idea of all your debts, including how much you owe and to whom. Once you know this you can start looking at your debts and concentrate on paying off your loans and credit cards that have the highest interest rates first and then move onto the next. Gradually, over time, you will see your debts become smaller and smaller. Fix-term debts, such as mortgages, are often best to leave alone and just ensure that you make the payments each month. This is because a schedule has automatically been put in place for an end date to the debt and therefore as soon as you took on this loan you knew when you would be able to clear the debt.